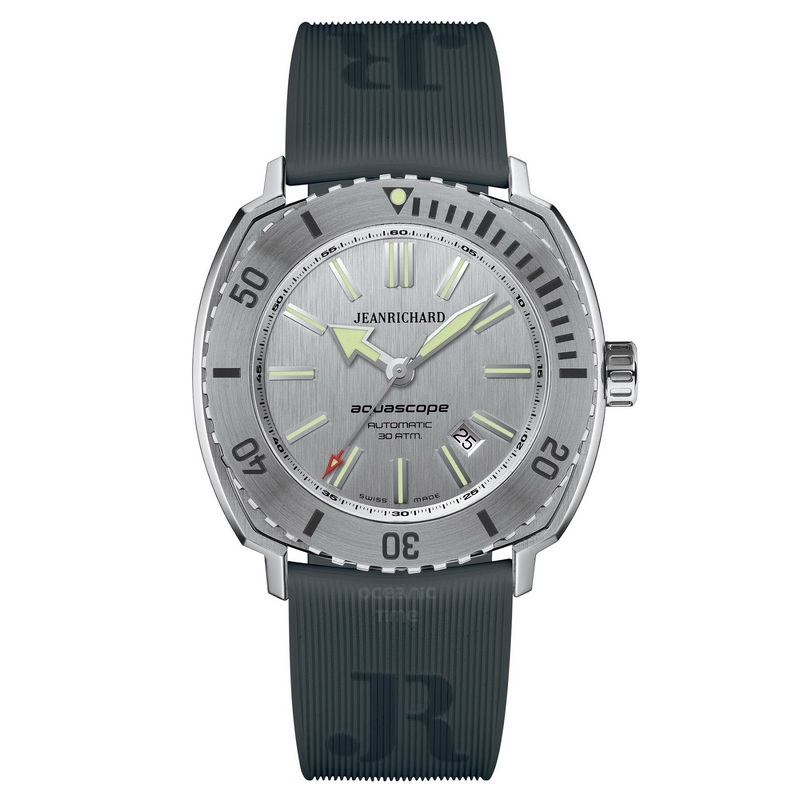 By TLex JEANRICHARD have released an all new Aquasope collection for 2013. 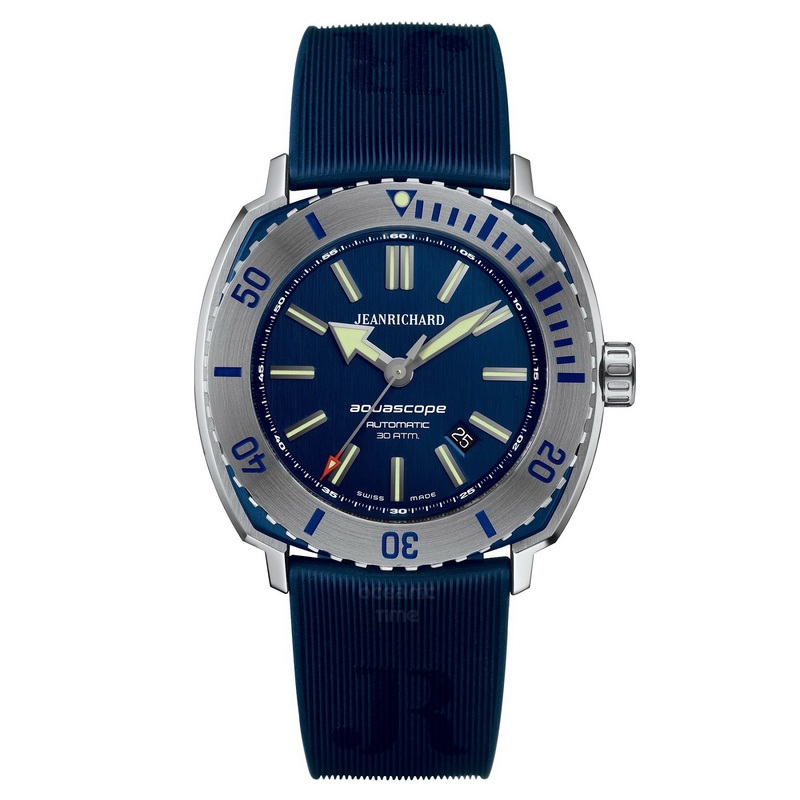 The re-designed Aquascope features a 46mm x 13mm robust cushion-style case, with a reinforced Sapphire crystal and screw-down caseback and crown, ensuring a water resistance of 300 meters. 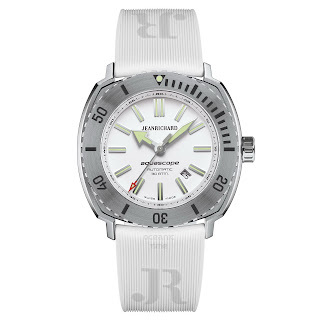 Its unidirectional rotational divers bezel has been designed for excellent grip and precise setting of dive-time thanks to its beautifully knurled edge and minute scale. The hour and minute hands have been shaped very distinctly; as with the large applique indexes, they are backed by a luminescent coating offering optimal visibility for divers. 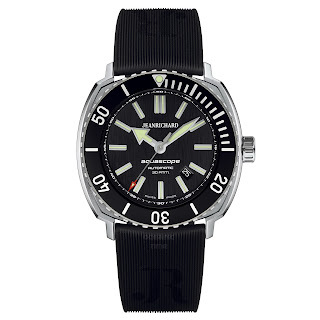 The red-tipped second hand allows the wearer to quickly check if the watch is working a requirement for some regulations for divers watches. 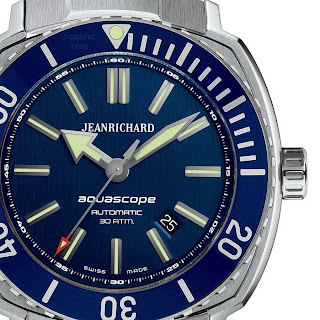 The new case design of the Aquascope distinguishes itself with some very clever finishing touches such as satin-brushed on the flat surfaces of the mid-case and lugs contrasted by polishing on the beveled edges. These attractive details are further enhanced by the contrast between the circular satin polish of the bezel and the vertical satin brushing on the dial. 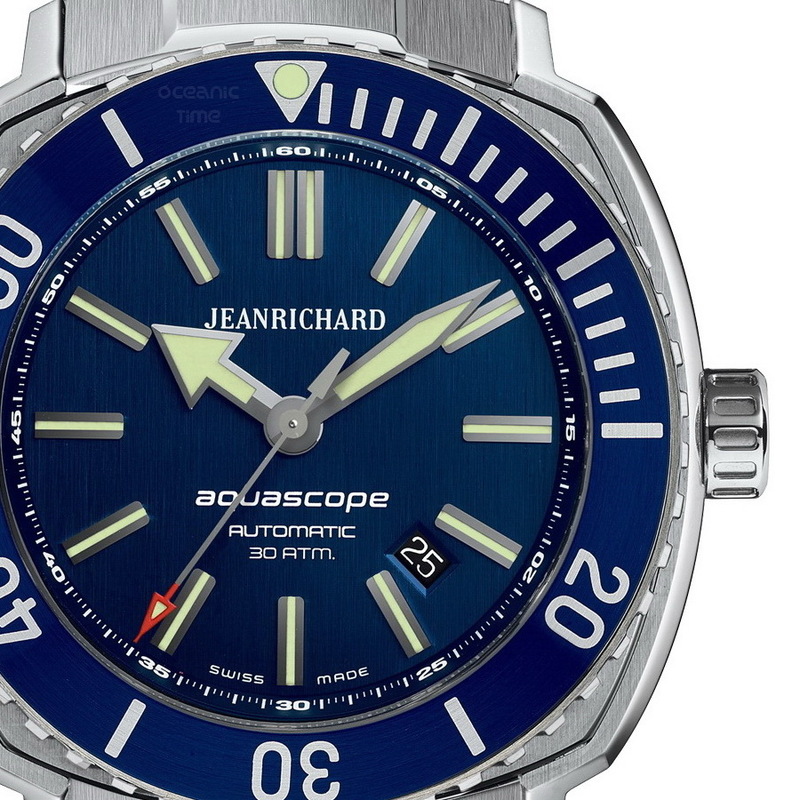 The new Aquascope is driven by a high-powered automatic wound mechanical movement, the JR60. It is presented on an all new brushed Stainless steel bracelet with a butterfly clasp. It also comes with a finely streaked rubber divers strap signed JR, and a folding clasp made to match the dial. There's nothing revolutionary here to be honest. I definitely prefer the more traditional single crown at 3 o'clock as apposed to the dual crowns of the PREVIOUS models. 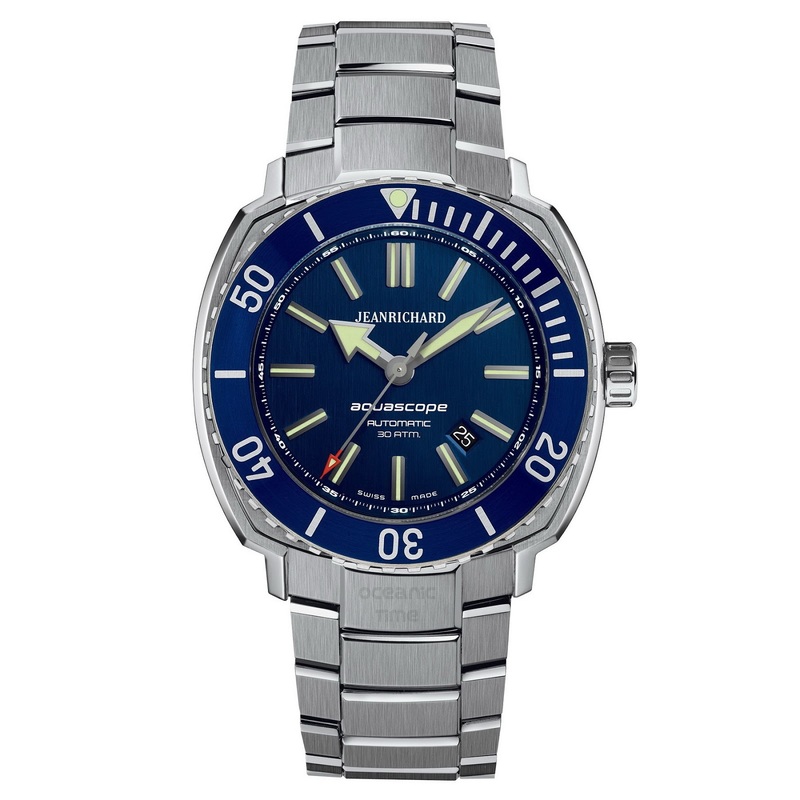 The Aquascope was always meant to be somewhat classic in its design - if you want something edgier then there's the new Sea HAWK from sibling Girard-Perregaux. 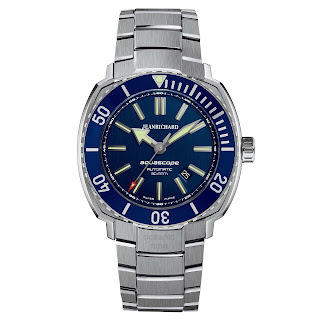 For me the watch looks more refined and more utilitarian and is a little more clearly defined as diver.